Istanbul’s Kurtuluş neighborhood is home to a number of slow-burners, establishments that may be hidden in plain view due to their plainness but that end up becoming some of our favorites. Gimmicks don’t fly in down-to-earth Kurtuluş, where neighborly ties are strong and home-cooked meals are preferred. 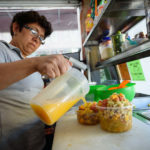 Tucked on a side street in the middle of the quarter is a small eatery that exemplifies this tried-and-true character. Behind windows that fog up quickly in the winter sit a handful of tables facing an open kitchen in what might be Istanbul’s coziest restaurant, Ben-u Sen (“Me and You,” fittingly), which showcases the divine ev yemekleri (home cooking) of the delightful Nuray Güzel. Guests are greeted warmly by the 65-year-old Güzel, who sports a hairnet and a gleaming smile while presiding over a number of classic dishes that are cooked fresh daily, with endless love and attention to detail. Most are gone by the evening. 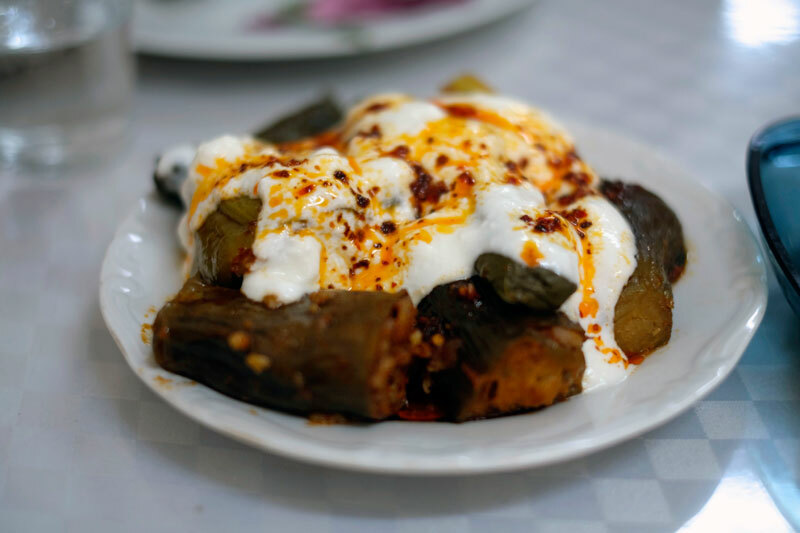 A steady roster of yaprak sarması (stuffed grape leaves), patlıcan dolması (stuffed eggplant) and mercimek çorbası (lentil soup) can usually be found on the daily menu. All are perfect renditions of beloved home-cooked staples. 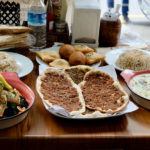 Other fixtures include mantı çorbası, a flavorful soup with hand-shaped dough pockets formed around a kernel of beef, and a stunning içli köfte. Similar to one variety of kibbeh, this dish consists of an oval-shaped lump of bulgur with an interior of spiced beef morsels usually baked in the oven. 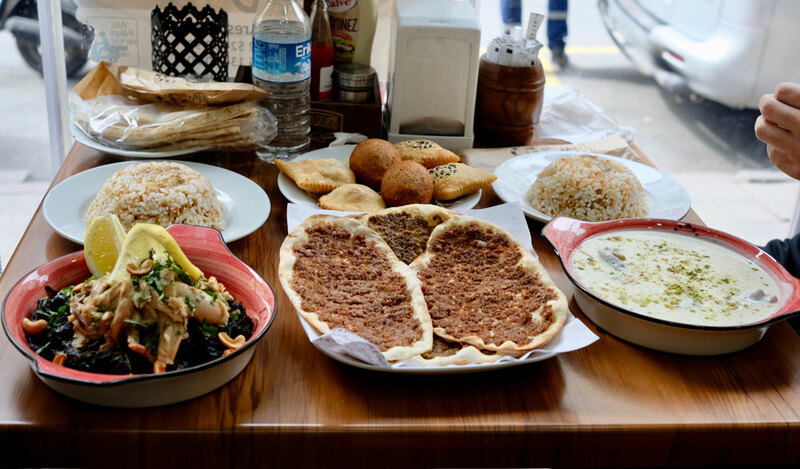 Güzel’s version is boiled to order and features a harmonious array of spicy, savory and sweet flavors. “It’s made with parsley, black pepper, red pepper, and cilantro,” Güzel said of the içli köfte’s magical spice blend. “I use butter and never oil,” she added. Like many of her dishes, it’s drizzled in a spicy pepper sauce, a southeastern accoutrement. Güzel is an Armenian from Diyarbakır, with roots in a community that was prominent in the southeastern city until most of it was driven out during the ethnic cleansing that took place in the region during World War I. In an effort to reconnect with its severed past, the city recently restored the iconic Surp Giragos church, though it saw damage in the intense skirmishes between Kurdish rebel groups and security forces that broke out in 2015 and obliterated much of the historic Sur district. 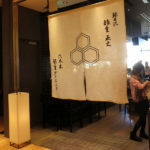 Photographs of historic landmarks from the city (some of which have also been severely damaged in the conflict) adorn the walls at Ben-u Sen, a sad reminder of calmer, more hopeful times. Despite not having visited Diyarbakır for 15 years, Güzel wears her hometown pride on her sleeve and speaks with a charming southeastern brogue. At the same time, she has become an integral part of Kurtuluş, living there ever since migrating to Istanbul in 1972. 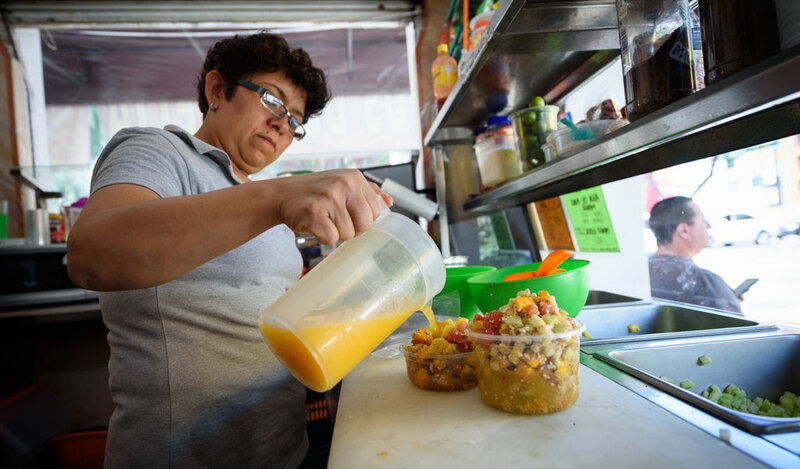 She wowed guests at home for years with her impeccable cooking, which eventually turned into a full-time job. “I married off my two sons, then my husband died. I got bored at home and decided the best thing to do was work,” Güzel said. 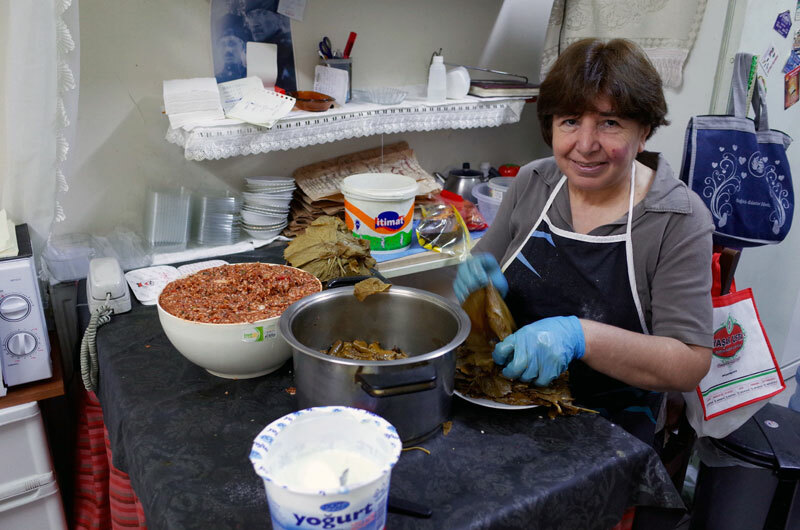 She opened Ben-u Sen in 2004 and works with a small kitchen crew, including her friendly son Hakan, who can always be found at her side, sometimes helping with the job of rolling up the grape leaves. 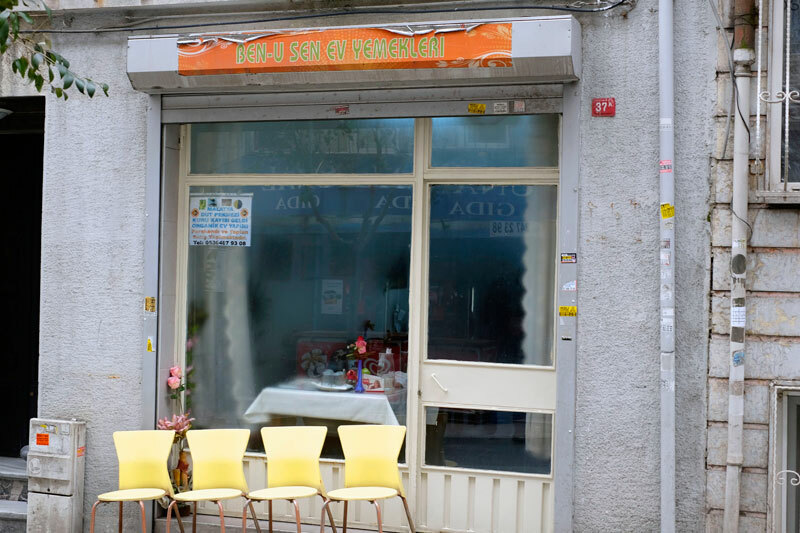 The prices at Ben-u Sen are as reasonable as Güzel’s dishes are delicious, and on a recent visit we forked over a mere TL 23 (US$6.25) for two bowls of hearty, garlic-laden tavuk çorbası (chicken soup with noodles, which Güzel refers to as a wintertime “antibiotic”) two içli köfte, a heaping serving of patlıcan dolması and a plate of briskly acidic pickled veggies. 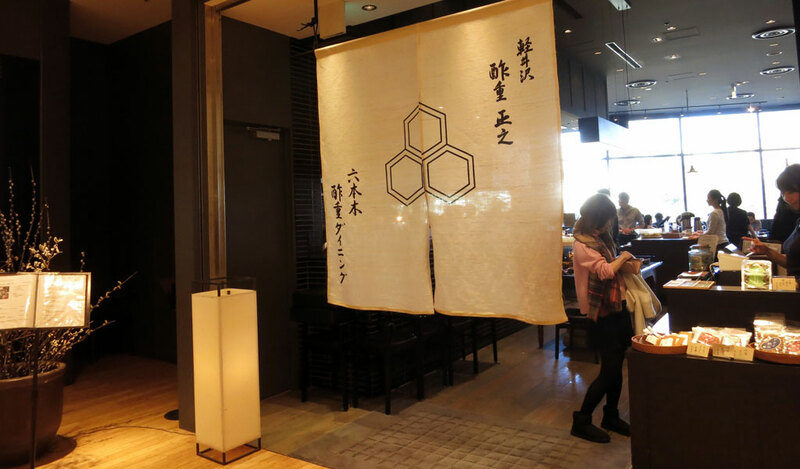 Ben-u Sen challenges the “too good to be true” mantra, as the wonderful food, low prices and Güzel’s warm, comforting demeanor amount to a neighborhood favorite that we could easily visit every day. Upon leaving, one can expect to exit with Güzel wishing strength and health, a blessing one can already count on via her life-affirming cooking.